A rare subtype of an already rare cancer, heterologous mesothelioma is less understood than the disease’s other forms. Because only a handful of cases have been documented in medical literature, researchers are still debating an absolute definition of the term, and have yet to determine statistics for its true incidence and survival rates. The clinical characteristics of this cancer are not much different from other types of mesothelioma. Its histology, or the type and visible structure of the cancer cells within the tumor, is what makes this subtype unique. Heterologous tumors are peculiar because they contain bodily tissues different from the tissues in which they form. Recorded elements in tumors include bone, cartilage and soft tissues. As more cases of this subtype emerge, researchers aim to define the term more accurately and uncover how this histological subtype affects the course of treatment and patient survival. Although the occurrence of heterologous mesothelioma, like all other forms of the disease, has been linked to asbestos exposure, the exact mechanism behind this histological anomaly is not fully understood. Researchers have yet to determine how elements like bone and cartilage tissue arise in asbestos-related cancer tumors, but evidence suggests a process known as cellular differentiation plays a significant role. Differentiation is a normal developmental process through which a less-developed cell becomes specialized to perform a distinct task. Connective tissue cells, for example, perform functions distinct from those of bone cells, yet they develop from a common cell line. Once a cell differentiates, it is rarely able to divide and only performs the job it is intended to do. When a cell is cancerous, differentiation does not occur normally. Cancer cells come in various levels of differentiation, but are generally less developed than the healthy cells that surround them. Poorly differentiated tumor cells no longer resemble the healthy cells from which they formed, and are often associated with a negative prognosis. This is because tumors with poor differentiation grow and spread more aggressively than tumors with well-differentiated cells. As indicated by its name, mesothelioma cancer is a mutation of the cells that compose mesothelial tissue. This tissue forms a protective membrane known as the mesothelium, which lines several body cavities including the lungs, heart and abdomen. Mesothelial cells are known for their ability to differentiate into various types of connective tissue, leading researchers to believe they may have applications in regenerative therapies, much like stem cells do. The natural versatility of these cells, combined with the genetic changes of cancer, might explain how heterologous elements form within mesothelioma tumors. 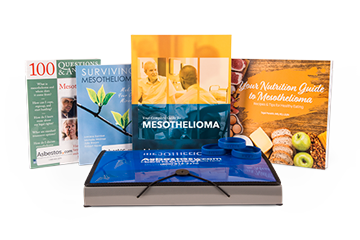 Our current knowledge of heterologous mesothelioma is severely limited by the small number of cases described in medical literature. In one of the most comprehensive studies on the topic, 27 cases were characterized clinically and pathologically for the journal Modern Pathology. The elements found within these 27 cases included osseous differentiation (bone), chondroid differentiation (cartilage) and liposarcomatous differentiation (soft tissue). Osseous and chondroid elements were most common, with liposarcomatous elements being particularly rare. A handful of mesotheliomas with rhabdoid differentiation, which has histology similar to a kidney cancer called Wilms’ tumor, was described as well. Approximately 89 percent of the heterologous cancers in the study arose from the pleural cavity, which surrounds the lungs. The remaining 11 percent of the tumors formed in the peritoneal cavity of the abdomen. With patient age ranging from 27 to 85 years, the median age at the time of diagnosis was 68 years old. A history of asbestos exposure was confirmed in all cases for which exposure history was available (63 percent of all cases). The average survival for patients in the study described above was six months. However, conflicting survival data was noted by the researchers. The overall average survival for mesothelioma is about 9 months, yet four of the heterologous subtype cases studied displayed survival of more than three years after diagnosis. Most unusual was a patient with osseous differentiation who survived for 69 months. These outliers are not completely understood, but some authors attributed extended survival to the expression of a protein known as bone morphogenetic protein 2 (BMP-2). Because only a small sample of heterologous mesotheliomas was studied, there is no way to be sure that six months is the true average survival rate. As additional cases emerge and more data becomes available, our understanding of this type of mesothelioma will continue to grow. Researchers have identified several issues that must be resolved in future studies. First, there is no clear definition of the term heterologous mesothelioma or mesothelioma with heterologous elements. Researchers also noted that some of the documented cases do not specify whether the tumor had true malignant heterologous elements or benign (noncancerous) growths, which is an important distinction. The authors of the study published in Modern Pathology suggest the term heterologous mesothelioma be reserved for tumors that display malignant heterologous elements like bone, connective tissue, or rhabdoid differentiation. It was also noted that no specific criteria exist for what elements should be considered heterologous; researchers, for example, questioned whether soft tissue and smooth muscle elements should be included in the subtype. They did not recommend a minimum percentage of heterologous elements be required for diagnosis, as is the case with biphasic mesothelioma. Lastly, researchers stressed the importance of determining the true incidence of this subtype, which is presently unknown. In the 27 case series, the incidence corresponds to about 0.5 percent of all mesothelioma cases. However, researchers were concerned this may be an overestimate. Gordon, I., Sitterding, S., Mackinnon, A. and Husain, A. (2009). Update in Neoplastic Lung Diseases and Mesothelioma. Archives of Pathology & Laboratory Medicine: July 2009, Vol. 133, No. 7, pp. 1106-1115.